Morning starts with the picture of Victoria and Rolando consulting, the latter giving tips and advices to the first, about her projects. All day is spent at home. Lunch is consumed at 16, in an atmosphere of drowsiness and mild, frivolous worry. Tonight’s Show and Tell illustrates a broad picture of trailers – but first, everybody is invited to go up on the residency’s rooftop, situated on one of the two towers, where Raw and Nadav are going to perform. The audience is asked to sit all around the circular space, so to create sort of an atmosphere of energy. Strong, intense, shocking performance. Dressed both in black, Raw runs against Nadav more and more times. He stops her pushing with his hand open on her head. As she tries to fight, he continues stopping her. At the end she gives up and he kind of excels her. Nevertheless they hug after the performance. Comments are shy and poor, since the action are enough to explicate. The Show and Tell itself starts with the presentation of Rah and Nadav’s short movie in the abandoned house, where Raw is entering a place in contrast with the external scenario and seems to be trapped into it. The clip seems to be ready, just the audio mix has to be improved. Dirar’s final version of the short movie at the beach is also showed. It reminds the arrival of refugees by boat during night. In fact, colors are predominantly in shades of blue. Also this clip is considered to be finished. Victoria’s performance comes right afterwards. Everybody is invited to go outside of the main entrance door. Lights are set up. Rasmus and Nadav are taking three iron poles and build a sort of entrance (representing the door of a house) with them. Gabriella brings a white blanket. They perform some singing and spooky sounds. They physically go in through the door. Then, it is Rah to take the poles. They build another door all together, go also in through that. Every time they dismantle the door and build another one in another place. Nadav and Gabriella perform a dance, playing with the blanket. With two spiral iron pieces, they build what can be compared to knobs. The doubt arising is: should or should not it be a live performance? 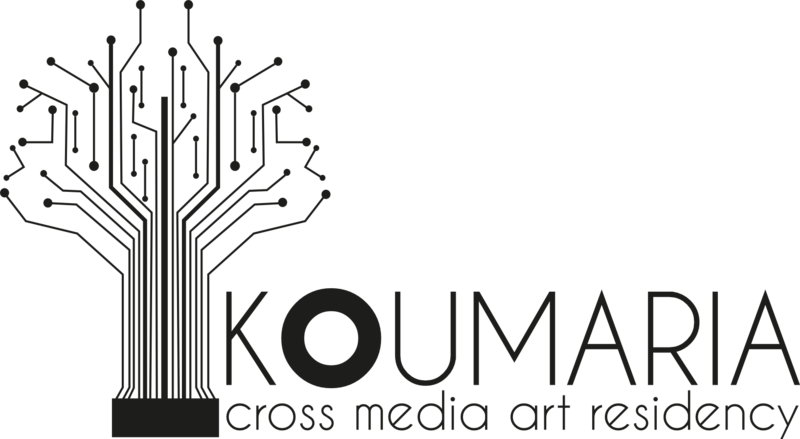 If merely documented and recorded, it would stay as a performance in within Koumaria Residency context. If it is going to be a live show, then a bit more energy of action should be added. Some special lights perhaps, or even wind. The performance itself should be stronger, even by staying simple. Minimalist aesthetics. The devil’s in the detail. Time issue is the main concern, though. Concerning Fawn and Alex’s graphite sensor, there are some sound troubles. Victoria also presents the video triggering trial with double bass, trombone and trumpet. The five commands triggered are: fire, river, sea, cemetery, rock. Audience is asked to push respectively five buttons, so to trigger the videos, connected with sensors to the computer system. The performance is three minutes long, but has to be fixed. Opera seria, not opera buffa. Live coding poetry, the modular poem built with Phyton commands corresponding to actions performed through dance, is the next trial. The sense of abstraction is stressed: the concept is to introduce more and more sounds so to produce “abstract” confusion. The idea is to produce commands and immediately execute commands, creating a kind of confusion with no rational sense. The live performance is planned to last 7-8 minutes. Akiko and Rasmus’ improvements are then showed. Their work on the performance is finished. Ready. Perfect. It should be just more long lasting, at least 15 minutes long. Fawn’s other project is performed afterwards: the light sensors thought for dancers to be worn, reacting to movement and waves. The light path is installed on a sweatshirt. Gabriella and Nadav dance in order to give a demonstration of the possible movements; in the meanwhile Guido, Dimitris and Eric improvise some music. What is still not perfectly working is the response of the light, which is in fact very slow. Panos presents a video shot at the trashing floor. He has got a 1-minute movie, already great as a standalone, but in need to be completed. Kleopatra has shot a video in stop-motion, this morning at the graveyard, with Angeliki and Rolando. She has added in post-production the voices from all Koumaria Residency people, recorded last night. Dirar’s video about memory is also ready, 6-minutes long, it only needs audio or perhaps the video can be reproduced in the same moment as live music performance.